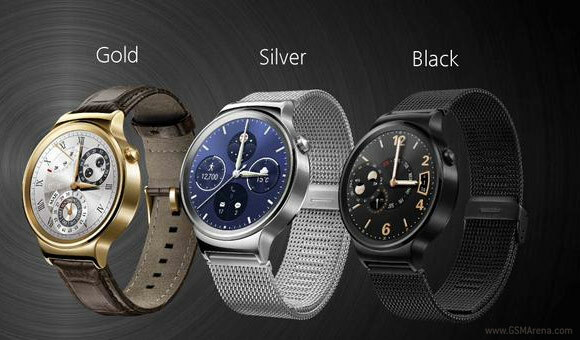 "A watch is a watch" says Huawei as it takes a swing at both Motorola and LG with its own round watch. The Huawei Watch is perfectly round like the LG Watch Urbane, but has thin bezels like the Motorola Moto 360. This is the first Android Wear watch with a sapphire crystal, also beating Apple to the punch. Below it is a 1.4" round AMOLED display, making it among the smallest of the current generation. The screen has 400 x 400 resolution, making it sharper than both the LG and the Moto 286ppi. The case measures 42mm and is made out of cold-gorged stainless steel. The Huawei Watch has been designed with wristbands for both men and women. They are interchangeable and Huawei will be offering metal and leather bands. The Huawei Watch contains 130 components and it takes 260 manufacturing steps, 160 of which are done by hand. Anyway, the company is proud that it used traditional watch elements like the crown. In this case it's Android Wear's usual single button, but it's placed off-center for ergonomic reasons. The Huawei Watch has a built-in heartrate monitor and comes with Huawei-made software for health tracking. The watch also supports Google Fit and Jawbone. There's an accompanying smartphone app which will be able to integrate with third-party wearables. The Sony Smartwatch 3 uses a micro USB connector for charging.